Christmas is coming quick. I already started my Christmas shopping. While I was in search of a few crafts to do with my girls this year, I came across a great idea to turn waffle cones into Christmas trees. There are so many ways to make the Christmas tree unique, which allows the kids to express their creativity. The best part about this craft is that it can be eaten once your finished. Lay out a sheet of wax paper for the kids to work on. Wax paper is great because the food won't stick to it. 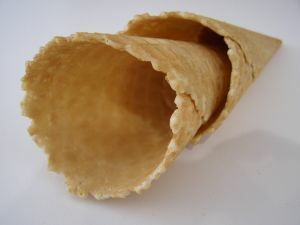 Flip the waffle cones upside down and set them on the wax paper. This is the base of your Christmas tree. Mix 15 drops of green food coloring in with the white icing. You can use either vanilla or cream cheese icing, it is entirely up to you. The goal is to turn the icing green. Spread a layer of the green frosting over the outside of the waffle cones. This will make the cone look like a Christmas tree. Sprinkle coconut flakes over the green frosting to make it look like the tree has snow on it. Dye a mini marshmallow yellow with a few drops of yellow food coloring. Press it down on the tip of the cone to look like a star tree topper. Decorate the Christmas tree cone with Skittles. These can resemble garlands or Christmas tree lights. Eat the Christmas tree cone.